Bankson Lake Farm tips the scales of what we know as conventional farming. To say it’s non-traditional is only the tip of an eccentric iceberg. Owner and operator Dan Owens, is a master in his profession. In full disclosure, we did not visit the Lawton-based farm that is “Bankson Lake”, but instead visited Dan’s home. Which is a huge part of the operation as well. And a marvel within itself. We were greeted by Hops and Barley, two very eager, high energy boxers. They were adoring, sweet, and immediately ushered in to the back yard. Now feeling well-received by the welcoming committee, Dan gives us the tour of his home operations, starting in the front yard. 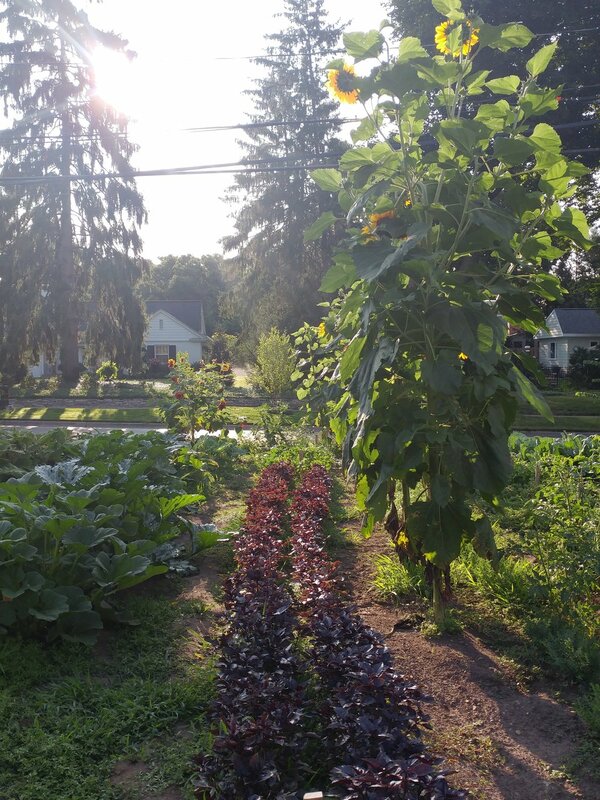 Dan thrives through the simple statement of “grow food, not lawns.” Dan is inspired by the works of JM Fortier, Curtis Stone and Elliott Coleman regarding sustainable farming frontiers. Living on a particularly busy road near downtown Kalamazoo, his house is hard to miss; it is a fully functional farm-garden. One of which had everything but grass. Rows of sunflower, asparagus, peanut varietals, squash, tomatillos, herbs, beets, goji berries and one very lovely banana tree, take the place of what would be a modern westernized lawn. It was absolutely grand. What grows in Dan’s front lawn is unlike anything produce-wise that you’d expect to find locally. Adapting banana trees, peanuts and tropical berry superfoods is daring, yet totally normal to him. He notes that due to a nearby bee allergy, he has decided against boxes on his home property. One of Dan’s top priorities is respecting his community neighbors, and keeping them well-stocked with exceptional produce. “Mycelium Marvel” Oyster mushrooms line the Bankson Lake Farm booth at the Portage Market. “Amazing Alliums” I noticed Dan’s hands were a bit raw and cut up. A tell tale sign that a farmer has been picking garlic. Alas, on the back porch sat baskets of market-ready bulbs. As we wrapped up our tour, there was a better understanding of the immense dedication Dan and farmers alike have put in to providing for us. It became clear that the work of a farmer never ends, just like the need for good food. This is a life commitment. We need folks like Dan to continue to pave the way in new cultivations methods that help fuel our bodies, and local economies.All while reducing our carbon footprint by eliminating substantial import consumption. Dan gives hope to the future that these exotics could potentially be grown right here, in our neighborhood. And that alone, is work worth doing. “Breaking Tradition”. While the surrounding lawns are perfectly manicured, Dan’s is a stark contrast to his neighbors. One of Dan’s true passions is the cultivation of food-grade mushrooms. Dan follows the works of Brian Callows, author of What the Fungus as a baseline for some of his mushroom cultivation techniques, and also recently attended one of his conferences this summer in Canada. He uses his own sawdust and mulches to create airtight bags of carbon-rich substrate, which in turn are put in the pressure cooker for some time to sterilize and remove all bacterial matter from the contents of the bags. Once cooled, these bags are inoculated with mushroom spawn. After these spawn eat up all the good carbon energy in the bags, is when they begin to fruit, or produce what we know as mushrooms. For now, Dan keeps these growing bags on steel storage racks, in a sterilized pop up insulated tent, complete with a separate filtration vent that assures clean air being circulated through. Varieties of pink, blue and yellow oysters are abundant, as well as lions mane. In the near future, Dan hopes to invest in a repurposed shipping crate, as a more permanent structure to grow mushroom varieties constantly. inside his home, sits yet another banana tree, some very stubborn wasabi, tropical cactus varieties, sensitivity plants that curl to the touch, sweet potato sprouts, along with an array of other unrecognizable exotic plants. The most prized being Madagascar vanilla bean. This is particularly tedious to grow outside of it’s normal habitat. Vanilla bean is a rare find in Michigan, and arguably unheard of. Could you imagine, local vanilla bean? Neither could we. I’d like to mention, this is one of the most admirable qualities of Dan Owens, his primary drive is of pure interest, and personal passion. Just to see if it can be done. It’s innovative thinking at it’s finest. “Kale Sale” Not a week went by that Dan’s market table wasn’t flourishing with every color under the sun.